More and more produce shipments are hitting DAT TruckersEdge, and rates overall are rising earlier than they did in 2016. Easter had the same effect on reefer load counts as it did on van volumes. There were fewer loads than the week before, since most load board activity was winding down early Friday. But the rush to get produce in stores has led to higher reefer rates out of Florida, Fresno, CA, and near the Mexican border in Nogales, AZ. The Hot States Map above shows where load-to-truck ratios are the highest. 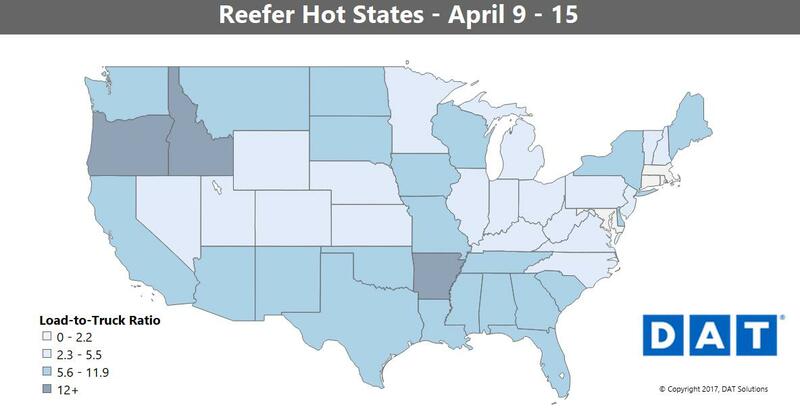 The darker the state, the less competition there is for reefer loads. Cinco de Mayo is right around the corner, so more avocados are crossing the border at Nogales, AZ. Lower volumes in Atlanta, Sacramento, and Green Bay kept the national numbers from rising higher. There were also fewer apples and eggs shipping out of Grand Rapids. Other than the declines in Michigan, the dips in volume don’t look to be part of any ongoing trend, so reefer freight still looks positive going forward.